Capybara Games' Critter Crunch for the PlayStation Network has more than just barf appeal, as one can glean from the puzzle game's latest screens. It also has "poisonous" mushrooms and critter crushing anvils. Oh, and versus mode. The folks at Capy have passed on a new batch of screens from their downloadable PlayStation 3 game, showing off some of Critter Crunch's cut scenes, power ups, world map and more. 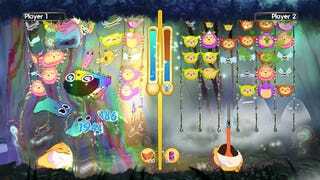 There's still plenty of technicolor yawning to enjoy, so for another look at what might be the PSN's cutest original offering, breeze on through our gallery. Then patiently wait for the game's summertime release.